A friend recently sent me a link to this chart. 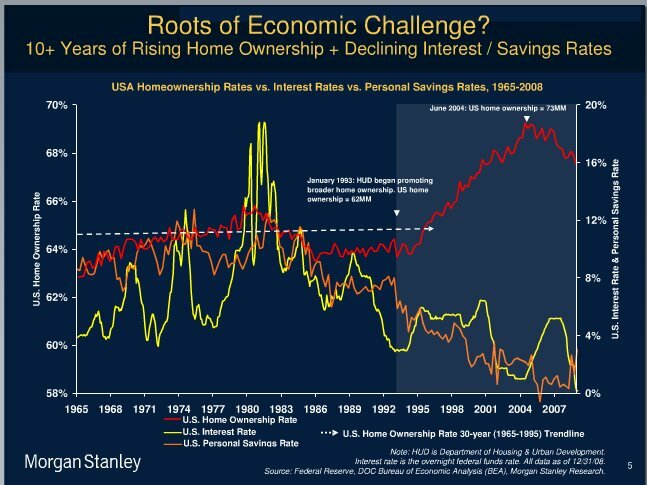 I think the implied correlation of interest rates to home ownership is questionable. On the other hand, it’s pretty clear that the savings rate and the interest rate are highly correlated. In high school calculus I remember learning about an equation for a 3-dimensional shape whose walls stretch to infinite, but whose volume is limited. Imagine that! It’s like a flower vase that stretches from the earth to the moon, and off to the stars, but which only holds a cup of water. It’s really neat in theory. But it doesn’t hold up in the real world. When I revamped Stanford’s program in Entrepreneurship in the early 1990s, I got to thinking about all the types of businesses people start. As I thought about the various business models, I realized I could boil them down to some basic characteristics, mostly around what they were selling. Some companies were based on people (e.g. services companies), some required large up-front investments, but had low marginal costs (such as software), and so forth. I found that people who were good at one of these business models often had trouble understanding or working in the others. Sometimes the timing of recessions in your life matters. If they occur at the end of your career, you should have enough cushion to ride things out. If they are early enough, you can reduce your expenditures, move in with your parents or friends, and seek low-paying jobs to hold you over. But what happens when you get hit with two recessions back-to-back when you are starting a family, just buying your first house, and just beginning to build a career? You can only reduce expenses so much, especially with kids. And you don’t have much cushion. Here’s an interesting little bit about the effect of the current and past recession on Generation X (born 1961 – 1981). Here’s a great chart comparing the losses in the stock market during various economic downturns, courtesy of www.dshort.com. From 2006 – 2008, Peter Schiff appeared on numerous shows predicting the economic collapse. This compilation of some of those clips shows him clearly articulating not only what would happen in the US and world economy, but also the mechanism and timing of the collapse. Despite his solid reasoning and clear articulation, many of the other panelists and hosts openly mocked and ridiculed him. This clip demonstrates two things: 1) the predictive power of the Austrian school of economics, and 2) the profound ability of otherwise intelligence people to ignore excellent arguments and instead believe what they want to believe.